Antique carriage clocks are valuable treasures from yesterday. They stand the test of time because of their durability, and have a timeless beauty and elegance that never fades despite the development of other timepieces. They are very expensive when sold, and continue to increase in value as they become older. Antique carriage clocks may be plain, engraved, or have decorated panels. 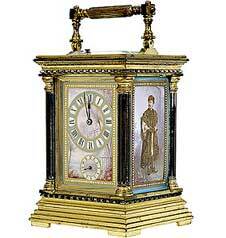 Their cases are constructed with a brass frame and this can help in dating the clock. If the brass frame is a solid, one piece cast frame, then you can be certain that it is pre-1850 since after the 1850s, the brass fames were constructed out of several pieces. Learn more here. Cottone’s Auctions will offer treasured pieces from Presidents and French Kings.